Salmon tends to be rather a large fish and you may want to ask your fishmonger for handy sized fillets for easy preparation and portioning. You will need between 150–200g per portion, depending on how hungry you are. Salmon fillets should be firm to the touch and show no signs of greying flesh. Buy sustainably if possible. Unlike salmon steaks, which have a small circular bone in the centre, fillets are usually boneless, though you can find the odd pin bone so be sure to check before cooking. When cooking salmon fillets, remember to check that they have been scaled and pin-boned before starting a recipe. There is no need to remove the skin as this helps to hold the flesh together while cooking. Salmon fillets can be cooked using a range of different methods, with the most common being pan-frying or roasting in the oven (en-papillote or drizzled in olive oil) at about 180˚C/gas mark 4. Fillets take no more than 5-10 minutes to cook, depending on the thickness. Once cooked salmon feels springy and the flesh should be flaky. Remove the skin before serving, if you’d prefer. Alternatively you can use a dry cure to 'cook' salmon, commonly know as gravadlax. 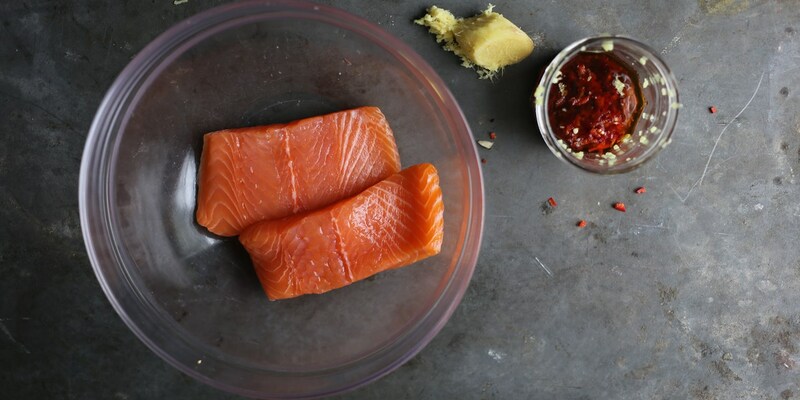 Complimentary flavours such as lemon and dill are used with salt to preserve the salmon fillet. Salmon fillets can be used in a number of recipes, from Adam Gray's Seared salmon with apple and radish to Mark Jordan's Pan-roasted fillet of salmon with marinated Jersey royals and dill and crab salad or Marcello Tully's Wild salmon and sesame mustard dressing.